Wait until you see what is behind this button-shaped gate! VVG Chiffon sells a selection of haberdashery and home related items. Here, you can find all sorts of fun furbelows for your latest sewing or craft project. There is a lot crammed into a tiny space! 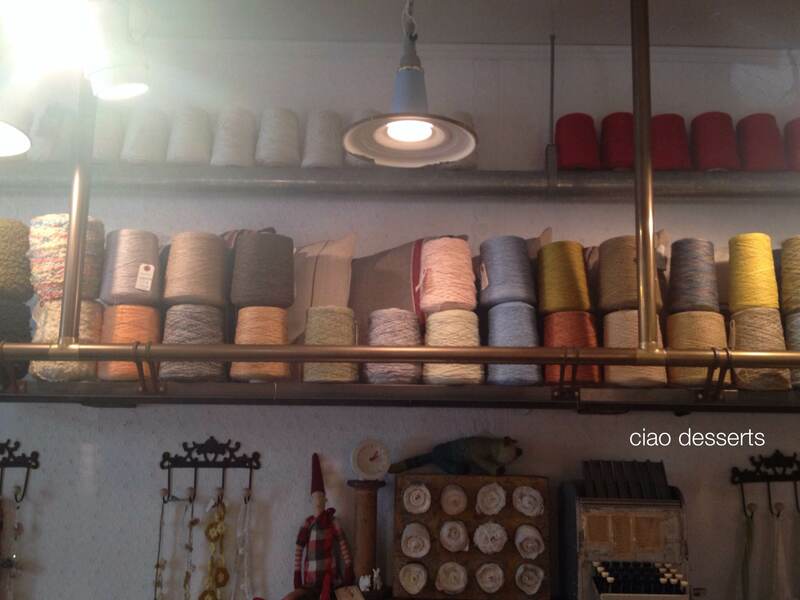 They even utilize the ceiling space to display different types of yarn and string. VVG Chiffon is also one of the only places in Taipei that sells a fairly big selection of colored Baker’s Twine~ I used to only be able to order it from Etsy; international shipping is so prohibitively expensive that I’m relieved to find a place to purchase it locally. Several of the signs in the store are handmade, embroidered no less! VVG Chiffon 雖然空間不大， 但每一個角落都有新奇的東西。 有緞帶，蕾絲，釦子， 布料跟小古董剪刀還有各式各樣的毛線，還有在台灣很難找到的五顏六色的 Bakers Twine. Towards the back of the store, there are antique cutting tables. I found some irresistable pretty ribbon in the bottom of this wire basket. When I got home, I realized that the little paper bag they used for the packaging was actually a page from an advertisement (DM). Recent purchases from VVG Chiffon: Ribbon and vintage inspired Japanese aluminum clips. The simple, yet aesthetically pleasing (and environmentally friendly) inspired me to go through all the DMs and brochures that I’ve been collecting (not hoarding!) and put them into good use. It only took me a few minutes to make one~ I’m going to use it to send a few washi tape samples,some pretty post-it notes, and a fun sardine shaped paper clip to a friend.